* Runners can get some great conditioning and help out an excellent equine therapy program at the same time next month. The Bull Valley Monster Hill Challenge 5K on April 6 benefits a local charity, Veterans Release and Relief. For more info and to sign up, go to raceroster.com. * NEWS FLASH: The McHenry County Equestrian is following three bills filed in Springfield for the state's spring 2019 legislative session that affect horses: SB 1420 (relates to insurance coverage for hippotherapy); HB 3339 (regulations for horse-drawn carriage industry) and SB 1179 (relates to county rezoning authority). Check back for information on the progress of these bills. * Look under the Equestrian Coalition of McHenry County tab for the list of their 2018 accomplishments on behalf of local horse owners. * McHenry County Equestrian wishes you a joyful new year! We are pleased to welcome 2019 and celebrate two more state laws beneficial to horse owners that are now effective. quality of life in Illinois. * State Legislative Update - SB 2713 was signed by the Governor on August 10 and will be effective law as of January 1, 2019. The bill amends the Recreational Trails of Illinois Act and allows greater freedom for the IDNR Greenways & Trails Council to plan for expansion/adjustment of trails on state land. * Did you know that there is a movement to ban carriage rides in the city of Chicago? It is fueled by the emotionalism and misinformation from non-horse owners, but any McHenry County horse person who goes downtown can see with their own eyes that the horses are well-cared for and not being overworked. This is part of a larger movement to stop carriage rides in every city; by people who believe that horses should not be ridden or used in any fashion, and instead should all be living in "sanctuaries" - with no thought as to where such sanctuaries might be; how they would be paid for; or understanding of the actual physiological and emotional needs of horses. If those pushing the ban really want to help horses or save horses; they can volunteer at a local horse rescue; donate to a local horse rescue or adopt a rescue horse instead of trying to cease a traditional use of horses. If you would like to support our carriage horse owners and carriage small businesses, please sign the online petition entitled ward42@cityofchicago.org: save chicago's carriage horses at www.change.org. Help spread the word about this initiative so that the horses can keep their jobs and their homes. 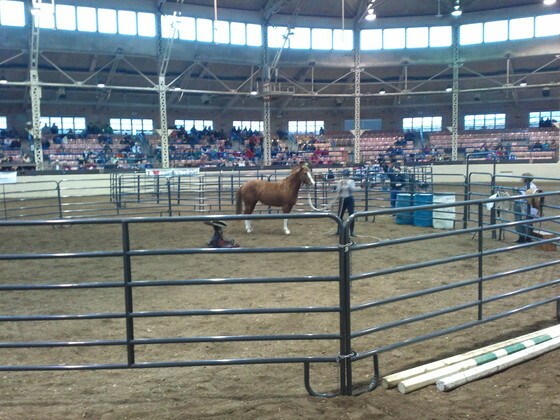 * The Midwest Horse Fair will be held on April 20-22 this year in the Alliant Energy Center in Madison, Wisconsin. Many people from our area attend this popular Fair, but not our own March 2-4 Illinois Horse Fair in Springfield. Did you know that the Midwest Horse Fair is owned by the Wisconsin Horse Council, and that proceeds (your admission fees) go to support equestrian activities in Wisconsin? They do not support our equine community here in Illinois. But our Illinois Horse Fair benefits your Horsemens Council of Illinois). So when you go to the Midwest Horse Fair, your dollars benefit equestrians in another state, not your state. Wisconsin's Horse Council doesn't help make new Illinois state law benefiting all horse owners, but HCI does. For all planning to attend this event, why not consider making an equivalent monetary investment in our state by making a donation to the Illinois Equine Foundation or enrolling with a base level annual membership in the Horsemens Council of Illinois? Food for thought. * Trainer Nicole Nystrom announces that private and group riding lessons are offered by Firecreek Farm, a boarding and training facility in Harvard. English, hunter/jumper and basic western lessons at Firecreek have a fun and individualized touch. Opportunities to show in a local hunter/jumper circuit are available. Summer camp starts soon so call Nicole at 872-216-9774 or visit the Facebook page for the farm (@learntoridehorses for more information. * Congratulations to Hank, a 25-year old AQHA gelding at BraveHearts Riding Center in Harvard. He is the first horse to win HCI's annual Dust Commander Lifetime Achievement Award for his excellent service as a therapy horse. He was selected for the well-deserved honor from a field of outstanding horses and the award was presented at the Illinois Horse Fair March 5, 2017. Check with HCI if you would like to apply this year for honor of a special horse or special horseperson in 2018. * KarMik Acres received a grant from the Illinois Equine Industry Research and Promotions Board at the 2017 Illinois Horse Fair for facility improvements including fans and wiring. The IEIRPB is funded by a check off program in Illinois. A few cents from each bag of grain you purchase should go to the fund, which is then distributed annually to applicants. So the next time you purchase feed, be sure to check to see if your supplier participates in the program. * Looking for gently used tack at a reasonable price in McHenry County? The Tack Exchange is now open inside the Prairie Avenue Antiques store at 9936 Main Street in Hebron. The offer consignment sales and are open daily from 10-5. Find them on Facebook (Prairie Avenue Antiques and The Tack Exchange). * McHenry County resident Dawn Davis has been appointed to the board of ELCR (Equestrian Land Conservation Resource), a nation-wide organization protecting our land for equestrian activity. As reported in the January/February 2017 issue of The Trail Rider, Davis currently resides in the prominent equestrian community of Barrington Hills, Illinois. Another great McHenry County resident stepping up to ensure our that our pastoral legacy and strong connection to horses continues. * On November 15, the McHenry County board unanimously voted to proclaim 12/13 Day of the Horse in our county, at the request of the Equestrian Coalition of McHenry County; and on November 17, the McHenry County Conservation District also unanimously voted to issue a Proclamation. 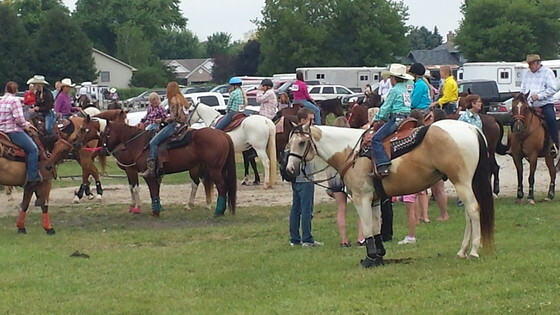 This is the first time that horses have been so recognized and honored in McHenry County by units of local government. * Congratulations to the Boso family and KarMik Acres in Woodstock - winners of the small division of the American Horse Council's 2016 Time to Ride Challenge. The contest, designed to help introduce the public to horses, took place from June 1 to September 30 of this year. For introducing the most people to horses of any group entered in the small division, KarMik Acres will receive a $10,000 cash prize. They money will go towards purchase of equipment for their barn - arena mirrors and a barn vaccuum. More details about this outreach program run by and for the horse community can be found in the news section of equimed.com. * The Equestrian Coalition of McHenry County (ECMC) is going to be honored by the Illinois Association of Park Districts with a Partnership Award next month. ECMC was selected for teamwork with McHenry County Conservation District (MCCD) on the Brookdale multi-use trail project to create a permanent horse trailer parking lot to service the newly opened trails at Brookdale. ECMC's fundraising of the $40,000 match required to receive the $160,000 Recreational Trails Program federal grant is an unprecedented achievement by an MCCD user group. The Partnership Award recognizes non-governmental organizations that have collaborated with a park district, forest preserve, conservation, recreation or special recreation agency in a significant manner, thereby enabling the public agency to initiate a major capitol improvement program, or pursue a campaign, initiative or project that enhanced residents' quality of life and would not have been achievable without this partnership. The MCCD/ECMC team is one of four honoree teams state-wide. The other winners are the Glenview Park District with the Grove Heritage Association; the Plainfield Park District with Starwood Retail Partners - Louis Joliet Mall; and the Rockford Park District with Friends of Beyer. ECMC is composed of several local riding groups including the McHenry County Horse Club, The Bull Valley Riding Club, the Riding Club of Barrington Hills, the McHenry County Saddle Club and the Spring Grove Horse Shows Association. ECMC founder and Chair Elaine Ramesh noted that when united, the strength of each individual equestrian group is magnified, allowing great things to be accomplished. ECMC met its fundraising goal by tapping three different grant sources; entering and winning a cash prize for second place in the nationwide Time to Ride Challenge contest; working collaboratively with the McHenry County Conservation Foundation; participating in Pedal Paddle Saddle events; baking & selling horse cookies; and holding other fundraisers as part of a multi-year effort. Congratulations to ECMC, all the members of the associated groups who helped, and all the individuals who donated to the project. * Members of the Equestrian Coalition of McHenry County met on June 22 with Jane Grover, the Outreach Principal for the Chicago Metropolitan Agency for Planning and listened to a presentation about CMAP's regional planning initiative, On to 2050. Long-term land use needs, the local economic advantages of horse keeping, and concerns of the equestrian community were discussed. The input will be considered during the process of drafting the next regional long-range plan. 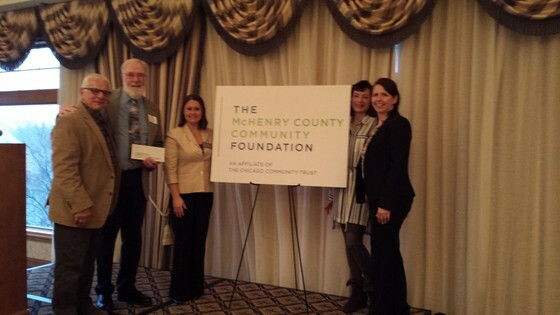 * Equestrian Coalition of McHenry County representative Elaine Ramesh; McHenry County Conservation District representatives Vern Scacci and Elizabeth Kessler; and McHenry County Conservation Foundation representative Dave Brandt attended the McHenry County Community Foundation's 2016 Grant Breakfast in Lake in the Hills on March 24, 2016. They received a $5,000 grant from the Community Foundation to be put towards the permanent horse trailer parking lot project at MCCD's Brookdale site in Woodstock. With this grant, the Equestrian Coalition has come very close to raising all $40,000 required as a match to receive RTP funding for the project. This grant marked the first time the Conservation Foundation has received funding for an MCCD project from the McHenry County Community Foundation. * The McHenry County Equestrian is pleased to announce the addition of Shadowood Farm in McHenry to our listing of local boarding and training barns, and Go Sleigh, a farm that provides sleigh ride adventures in Harvard, Illinois. The equine community in McHenry County keeps growing stronger. Contact us if your boarding barn or equine related business is not yet on the list. * We're pleased to announce that another barn has been added to our listing under the Local Boarding/Training tab. Mohawk Farm has been operating in Woodstock since 1976. They offer full service boarding, training, leasing, lessons and clinics. 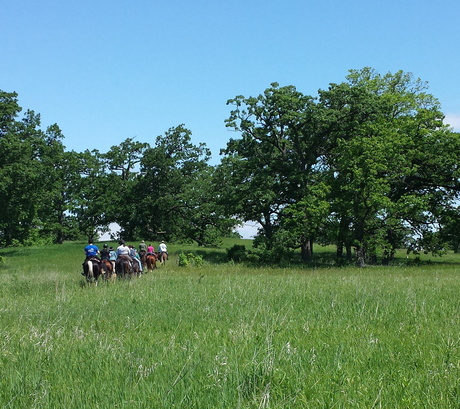 Summer horse camp is going on now, so call 815-347-5649 or email meetmeatx@yahoo.com for further information and to enroll. Summer camp participants will get a discount for purchases of riding attire at Saddlers' Row. Don't see your barn listed? Contact us to have your barn or event posted for the McHenry County horse community to see. 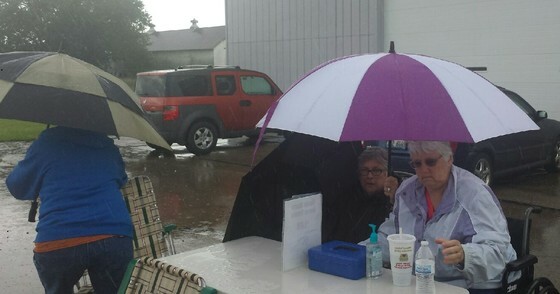 * Despite the rain, local horsemen turned out on Sunday, June 7 for the annual Pedal Paddle Saddle event put on by the McHenry County Conservation Foundation to benefit McHenry County Conservation District. 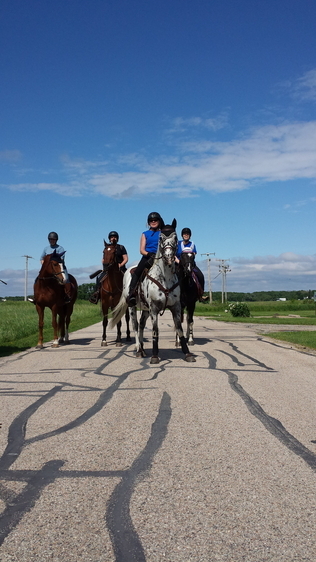 This is the second year that an equestrian trail riding component was added to the fundraiser. The sponsorships and registration fees of equestrians totalling approximately $1,400 have been added to the fund being collected for the permanent trailer parking area at Brookdale. * Congratulations to Vern Scacci, President of the McHenry County Horse Club for his appointment on June 2 by the McHenry County Board as the newest board member of the McHenry County Conservation District Board of Trustees to a five year term. 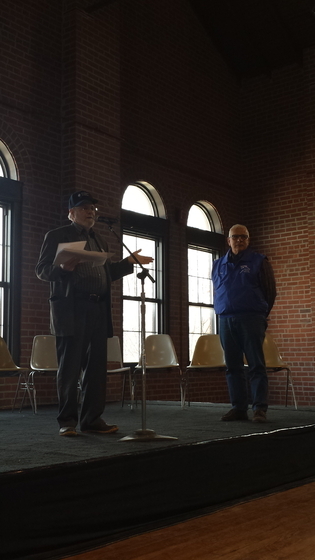 Vern is pictured below at left, at the opening of the new public trail at MCCD's Brookdale site. Vern's business background and past service as an elected member of local government will serve him well in this position. * A new horse has been added to the McHenry County Conservation District map! 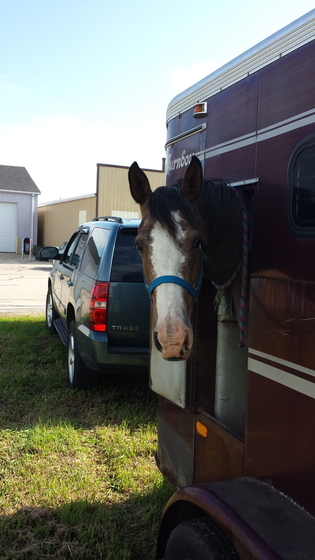 The horses on the map mark the sites that equestrians can park a horse trailer at so they can come and ride a public horse trail in McHenry County. The Equestrian Coalition of McHenry County is pleased to report that our map now has 5 horses on it! 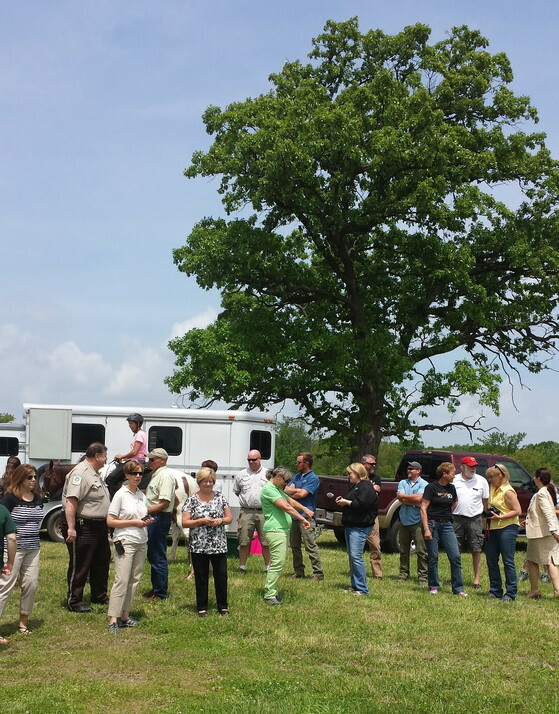 Brookdale Horse Trail Ribbon cutting - horses and their people celebrate! * Today marked the soft open of the new 4.5 mile trail at the McHenry County Conservation District Brookdale site in Woodstock. Local dignitaries attended the event which the Equestrian Coalition of McHenry County has worked diligently towards for the past three years. This project marks the first time the District has partnered with a user group in a coordinated effort to raise the necessary funds to bring a new recreational amenity to our community. To date, the equestrian community has raised more than $20,000 through a mixture of fundraisers and grant applications to be used as matching funds for a Recreational Trails Program $160,000 federal grant that MCCD has applied for in order to build a permanent horse trailer parking lot. The ribbon was cut to open the trail with temporary horse trailer parking by McHenry County Conservation District President Dave Brandt along wiith Bull Valley Riding Club President Linda Fierla, McHenry County Horse Club President Vern Scacci and Riding Club of Barrington Hills President Elaine Ramesh. * Vern Scacci, President of the McHenry County Horse Club, accepts a $5,000 grant award from Dave Nobbe of the Illinois Equine Industry Research and Promotion Board on behalf of the Equestrian Coalition of McHenry County for the Brookdale Public Horse Trail project in Springfield on Sunday, March 8. Funding will go toward the match required for the Federal RTP grant application recently filed by the McHenry County Conservation District. 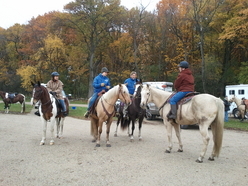 * The September 20 sneak preview of the new public horse trail at McHenry County Conservation District's Brookdale site wowed the 30 riders who turned out on a Saturday morning to try out the new trail. 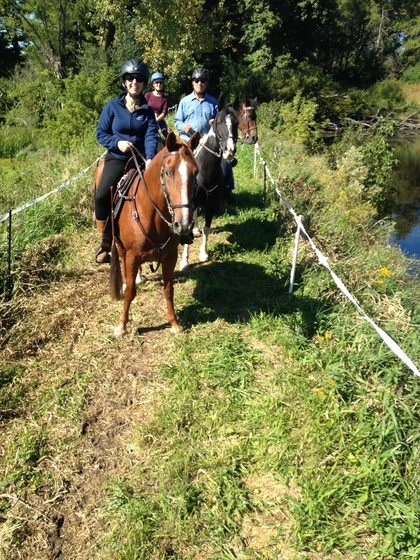 Pictured above are three adventuresome McHenry County Horse Club members who helped break in the 5 mile long trail. The site is not available for further riding, but the permanent opening is expected next spring, as soon as parking area details can be worked out. to learn more about the process and projects which have won the grants in the past. * The first time participation by equestrians in the McHenry County Conservation Foundation's former Peddle Paddle fundraiser (now called Peddle Paddle Saddle) event on June 8 was a great success. 30 horses and their riders from Barrington Hills and all over our county rode out in Glacial Park on a glorious crisp morning, captured in the photos below. From Icelandic ponies to a belgian draft horse, all shapes and sizes of horses enjoyed a terrific ride. * Local trainer teams up with local rescue horse for the inaugural Heartland Horseman's Challenge held during HCI's Horse Fair in Springfield. Woodstock's Hooved Animal Humane Society provided rescue horses for the trainers to choose from. 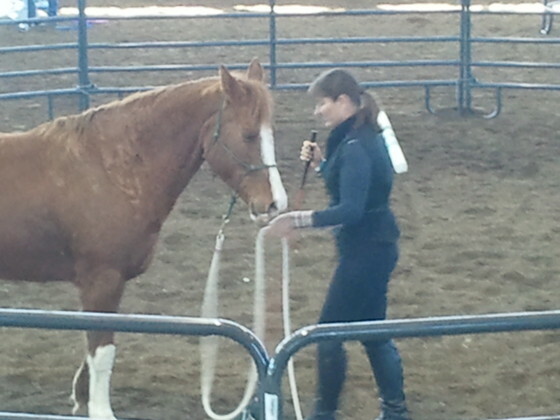 The trainers worked with their horses in three round pen sessions in front of an audience. Local natural horsemanship trainer Gigi Iacovelli (gigihorses.com) selected Pippi Longstocking, an 8 year old quarter horse mare. Gigi was very successful in helping Pippi to overcome all the distractions of the arena and perform tasks such as walking over ground poles, walking over a plastic tarp and also a raised wooden platform. Gigi also mounted and rode her. * Here's a new event, and a way to hone your trail skills while the weather is bad. Meadowsweet Ranch is holding a Gambler's Choice Arena Obstacle Course March 30, 2014. Can you convince your horse to go over/through all eight obstacles? The event is a fundraiser to benefit Main Stay Therapeutic Riding of Richmond and Walk on Farm in Barrington. Lunch and musical entertainment will be provided. Register on-line (actha.us) by March 26 for the Spring Grove event. * Elaine Ramesh, Chair of the Equestrian Coalition of McHenry County, receives a $5,000 grant from the Illinois Equine Industry Research and Promotions Board for the McHenry County Conservation District project to open horse trails at the Brookdale McHenry County Conservation District site. 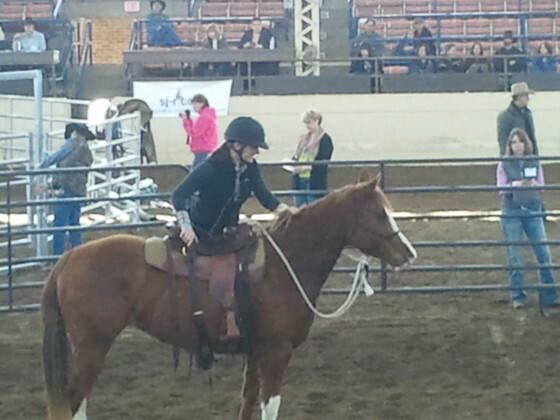 More than $40,000 in grants were given out on Saturday, March 8 at HCI's Horse Fair in Springfield to worthy projects for the equestrian community throughout the state. Including the grant, the group has raised more than $10,000 to cover costs to prepare the new trails. * News Flash: For the first time, the equestrian community will participate in the annual Peddle/Paddle event which is a fundraiser for the McHenry County Conservation Foundation. Instead of just a Peddle/Paddle event, it will be a Peddle/Paddle/Saddle event. 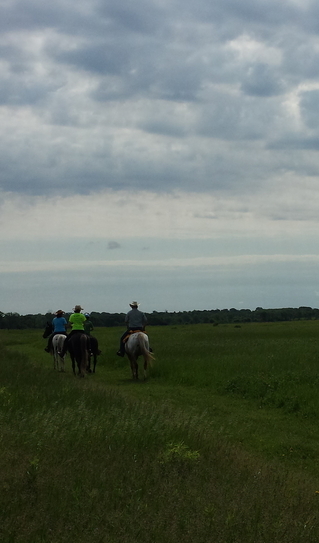 Equestrians will be able to participate by riding at Glacial Park on June 8, 2014. Pre-registration will be $25, and includes a t-shirt and lunch; additional donations will be accepted. Signs will direct you to an area for horse trailer parking. Equestrians can specify that their donation go towards the Brookdale Horse Trail Project. 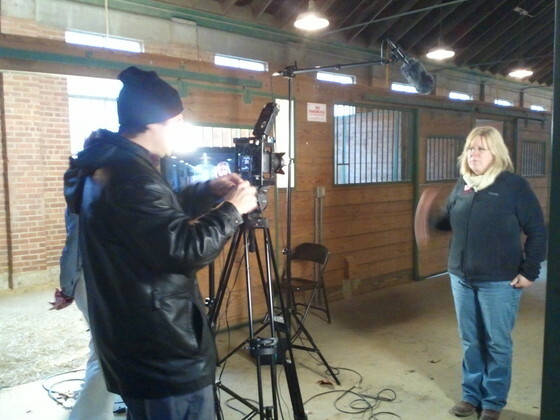 * Frank Wachowe of Lantern Creek Productions films a Purina feed dealer for a project to create short film clips to inform the public about the Illinois Equine Industry Research and Promotions Board grant program. The videos will explain the program and include interviews with grantees. 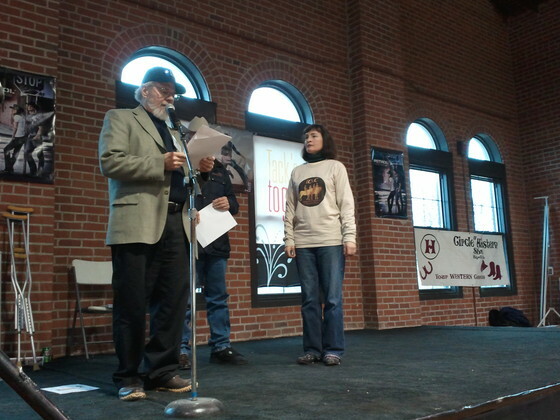 Filming took place March 8 during HCI's Horse Fair in Springfield. Watch this space for an announcement and link to the final product when it is ready. * More than 30 riders from Cook and McHenry counties came out for the ECMC fundraiser at the Cook County Forest Preserve's Spring Creek site on November 2. Everyone enjoyed a hearty breakfast and then hit the trails. The presidents of each member organization (McHenry County Horse Club, Bull Valley Riding Club and the Riding Club of Barrington Hills) came out to show their support. 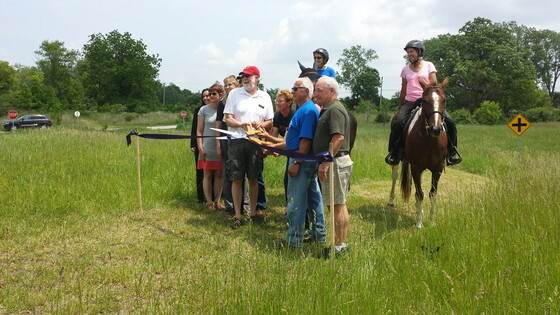 Money collected will be used to help open more public horse trails in McHenry County. Even if you weren't able to join us, you can still send in your donation using the form below. * Over a hundred walkers and runners participated in Mane in Heaven's 5K Trot-a-Thon to raise money for the miniature horse therapy program on October 20. 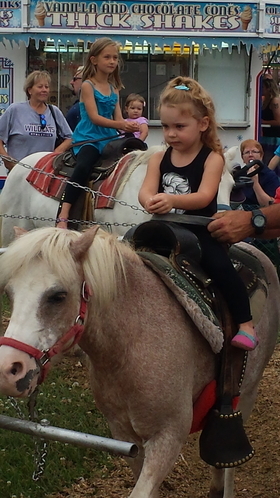 Participants were accompanied by a miniature horse pulling a cart, and enthusiastically cheered on by well-wishers. Channel 7 News was on hand to report on the event. 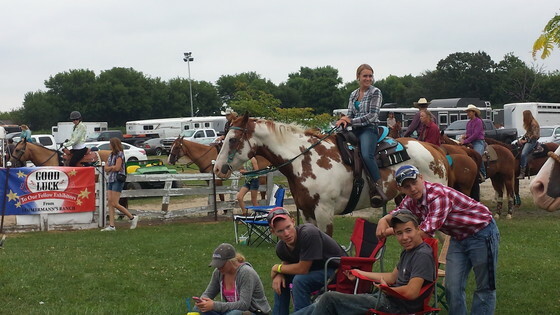 * The McHenry County Horse Club participated in the McHenry County Conservation District's Fall Celebration by bringing horses and tack so that members of the community who would like to "meet a horse" could do so. 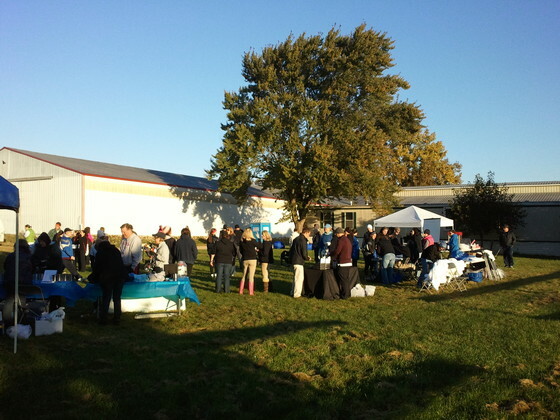 The Celebration was held on Saturday, September 21 at MCCD's Rush Creek site in Harvard; the program included a variety of family-oriented activities. Spanish language interpreters were also on hand. 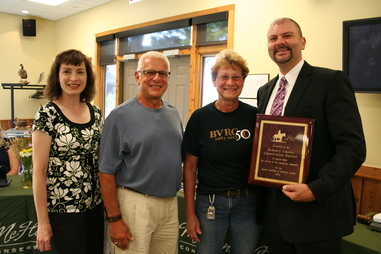 * Congratulations to the Bull Valley Riding Club, celebrating 50 years this year! The private club maintains 80 miles of private trails for equestrian use.